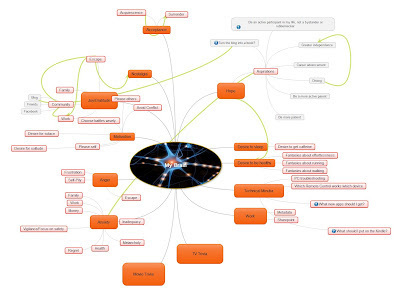 I've been toying with a new tool at work – something called mind mapping. I'm especially drawn to anything with the word "mind" or "brain" in it lately ("Squirrel! "), and it has been useful in capturing my somewhat scattered thoughts. I thought it would be fun and interesting to actually create a mind map of my mind, so that's what I've placed below. A picture plus words is worth a thousand plus words, after all. I dare say, it isn't all that different from others' minds.Warning: The image is large and and may be difficult to read, but I hope you can make it out. You may actually just want to open it in a separate window. Beautiful! I too am a huge fan of mapping and I try to incorporate it into my teaching a fair amount. I imagine my mind map would look a lot like yours. Great work! Joel, only you can map your mind. I used free software called MindMaple Lite.